We've customized The LPA Lease to conform with each state's requirements! Just select your state when downloading! Experienced landlords love The LPA Lease agreement because it represents many years of trial and error learning from very painful and expensive experiences with tenants. This residential lease form has successfully saved us repeatedly from serious tenant nightmares, and from losing a lot of money! Includes our LATEST NEW LEASE CLAUSES! The LPA Lease can be either Month to Month or Fixed Term. Easy to read and understand, The LPA Lease has evolved over the years and is highly praised by attorneys, landlords and even judges. Of course, we landlords like it the most because it was written especially to protect us. Time and time again, landlords who have paid their attorney hundreds, even over a thousand dollars for lease agreement to protect them, have switched to the LPA Lease! Why? Because it is a collection of the best clauses and lessons we found necessary to include for "maximum landlord protection". It does its job to discourage problem renters from signing on as our tenants. If the LPA Rental Application doesn't discourage the Deadbeat Tenant, the LPA Lease Agreement will. Let them disqualify themselves before they become your headache! We find that if a prospect passes our tenant screening requirements, he or she will agree to our lease agreement. Why not? 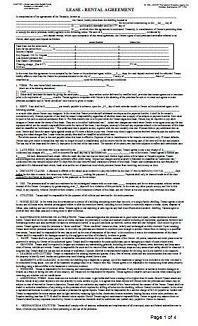 The lease form outlines in detail what is expected of an excellent tenant. We only want excellent tenants for our rentals and they are more than happy to agree to reasonable terms in our rental agreement. They will treat the property with pride and respect, and that makes being a landlord a great job. The LPA Lease Agreement form is specially written to cater to residential houses and apartments. The LPA Lease has the right stuff! even if you don't have MS Word. If possible, this lease should be read and explained to the tenant in person. We find it to be more effective that way. After all, it is an instruction manual for how to be your tenant in your rental property. Before turning over a valuable asset for a mere 1 or 2 month security deposit, make sure the tenants understand and agree to all your terms. You'd be surprised at how many people are so eager to just sign the lease without bothering to read it. You can get a real idea of what these people will be like as tenants by how they respond to the terms in your lease agreement. What does it tell you if the prospect has a major problem with your late fee policy? That's right, he expects to pay rent late. How about if the prospect argues about being responsible for minor repairs? Or if he has a problem with a penalty for unauthorized occupants? What if he has a real problem with the default clause, which outlines your rights to evict for nonpayment? The LPA Lease also includes a clause requiring the tenant to maintain Renter's Insurance, along with many other essential clauses designed to protect the landlord. You really can learn a lot about a tenant during the lease signing. Remember, our lease is not meant to be used as a weapon, it is a Landlord Protection tool to defend yourself and your property from unscrupulous tenants and difficult situations. Although the LPA Lease is a very powerful tool, it's even more powerful when you use it effectively. Also available in letter size and alternate word formats.